Last Friday we received word that Bill Hagenstein, a giant in the forest industry and the history of American forestry, had died. The following biography is adapted from the files of the World Forestry Center, which he helped to establish in Portland, Oregon. While it does a fine job of summarizing his life and career, it doesn’t begin to capture what a character Bill was. He never varnished the truth and was known for his direct, if profanity-laced, take on forestry and life, both of which are evident in his two oral history interviews with FHS and his colorful memoir Cork & Suspenders: Memoir of an Early Forester. As you’ll see he may very well have been the last living link we had to the first generation of American foresters. One of the most important American and Northwestern foresters in the twentieth century, William D. “Bill” Hagenstein was a key advocate for sound national and regional forestry policies that protected forests and ensured their continuing productivity. In addition to participating in the creation of the nationwide Tree Farm Program and pioneering other sustainable forestry practices, Bill provided expert testimony to the Oregon and Washington legislatures and the Congress for more than 30 years. A fourth generation Northwesterner, Bill was born in Seattle on March 8, 1915. When Bill was eleven, his father, Charles William Hagenstein, passed away and his upbringing was left to his mother, Janet May Hagenstein (née Finigan). Bill began working in the woods at age 12. Already six feet tall and 170 pounds, Bill was able to pass for 18, the minimum age required for logging by state law. Throughout his teens, Bill worked every summer in logging camps and by the time he was 19 he held his first foreman’s job. As the Great Depression set in, Bill traveled the country on freight cars between jobs in logging camps. In the early 1930s, he worked on several major forest fires in Idaho. These experiences educated him about the devastation that forest fires can cause without efforts to prevent and control them. In the fall of 1934, Bill returned to his mother’s house in Seattle after spending the summer on the disastrous Pete King fire on Idaho’s Selway National Forest. He had been out of high school for four years and his mother encouraged him to enroll in the University of Washington, just four miles away from where he was born. At enrollment, a woman at the registrar’s office rattled off an alphabetical list of possible majors. When she got to “f” Bill stopped her and selected forestry. Bill received his Bachelor of Science in Forestry in 1938. He had spent the summers working for the U.S. Forest Service and the Seattle Water Department. That year forestry employment was hard to come by, but Bill worked several jobs. First he was a fire warden for the City of Seattle on its Cedar River Watershed. Then he worked as a forest entomologist for the U.S. Bureau of Entomology and Plant Quarantine in northern California. Bill spent 1939 as a logging superintendent and engineer for the Eagle Logging Company in Skagit County, Washington. In 1940 he spent a few months as a foreman in a CCC Camp on the Snoqualmie National Forest. Spurred by his desire to see another part of the country—especially another major timber-producing area—Bill enrolled as a scholarship student in Duke University’s School of Forestry, from which he received the Master of Forestry degree in 1941. The West Coast Lumbermen’s Association (WCLA) immediately employed him as Forester for Western Washington. On January 20, 1942, Bill participated in the historic founding of the American Tree Farm System. Thirteen men, including prominent Northwest lumbermen and foresters, met in the old Portland Hotel and certified the country’s first tree farms. Bill was secretary of the meeting and signed its minutes. Tree farms were certified when their owners pledged to dedicate their lands permanently to growing, protecting, and harvesting trees for permanent production. Bill considered his part in this program, which spread quickly throughout the United States, to be one of the crowning achievements of his life. In 1943, World War II took Bill to the South and Central Pacific. He served as Chief Engineer of military lumbering in those theaters of war. Though often overlooked, timber was critical to the war effort. Lumber was needed for tent framing and decking, docks and wharves, bridges, hospitals, and dunnage for loading supply ships. In 1945, as the war was winding down, Bill was sent to Costa Rica to help establish a cinchona (quinine) plantation to grow the bark needed for producing the drug used to treat malaria. After the war, Bill returned to WCLA, which moved its headquarters in 1946 from Seattle to Portland. In 1947, after a change in Washington law, Bill qualified as a Professional Engineer in Logging Engineering. Upon his move to Oregon he was similarly licensed in that state. Bill became the organization’s Chief Forester in 1948. In 1949 WCLA created a new organization that focused entirely on forestry and called it the Industrial Forestry Association (IFA). Bill was named manager and later, when the organization officially incorporated, was elected Executive Vice President. Bill held that position until his retirement in 1980. At IFA’s peak, Bill had approximately 300 people working with him, including a professional forestry staff of 20. IFA’s mission was to develop a permanent timber supply in the Douglas-fir region as basic support for the Northwest economy. In addition to certifying tree farms in the Douglas-fir region, IFA operated four nonprofit nurseries, which grew trees for member companies. By 1980 the IFA nurseries had grown 500 million trees, which reforested one million acres on tree farms in western Washington and Oregon. In 1954 IFA started the first regional program of tree improvement to apply the principles of genetics to the growing of timber. This is now standard practice by industry and government. Among IFA’s most important tasks was professional expression of the needs of forestry to the public and every level of government. Over a 35-year period, Bill provided expert testimony to agencies and Congress on about 250 occasions. One of IFA’s strengths was its credibility on all aspects of Northwest forestry. Eventually, Bill and IFA became the principal national voice for the Douglas-fir industry. Bill joined the Society of American Foresters in 1938 and served this professional society in many ways, including seven years as associate editor of the Journal of Forestry, ten years on its Governing Council, and four years as President from 1966 to 1969. He was elected a Fellow in 1963 and was awarded the Society’s Gifford Pinchot medal in 1987. He served as a regional leader in times of crisis. As chairman of the Timber Disaster Committee of the Northwest Forest Pest Action Council, he led the salvage efforts to clean up the mess created by the Columbus Day Storm of 1962 that blew down 17 billion board feet of timber in five hours. This effort greatly minimized the proliferation of pests and forest fires that could have seriously damaged the region’s economy. Bill was active in the forest fire prevention campaigns of the Keep Washington Green and Keep Oregon Green Associations from their inception in the early 1940s. He served the Washington association as an Advisory Trustee from 1957 to 1995 and the Oregon association as Trustee from 1957 on and as President in 1972–73. A tireless promoter of forestry, Bill wrote more than 500 published pieces in a variety of media. He coauthored with Wackerman and Mitchell the textbook, Harvesting Timber Crops, widely used by forestry schools throughout the world. He delivered a speech every 10 working days for 35 years. In addition to appearing before professional and civic groups, Bill delivered lectures at universities in California, North Carolina, Missouri, Oregon, Washington, and British Columbia. Bill was a member of numerous professional associations and received many awards and honors. From a Portland hilltop, Bill witnessed the burning of the city’s magnificent Forestry Building in 1964, a massive wood structure that had been a cornerstone of the Lewis & Clark Centennial Exposition of 1905. In response to the absence left by this fire, Mayor Terry Schrunk appointed Bill and ten others as founders and builders of the Western Forestry Center, now the World Forestry Center. Bill’s varied career brought him in touch with many forestry luminaries. In 1940, when he was attending his first annual meeting of the Society of American Foresters in Washington, DC, Bill met and had lunch with Gifford Pinchot, America’s first forester and one of seven founders of the Society in 1900. Bill met five of the other founders at subsequent annual meetings. Bill retired from IFA in 1980. With no interest in retirement, he incorporated W. D. Hagenstein and Associates and continued working as a consulting forester for many more years. As his résumé shows, he was active in several organizations, including serving on the Forest History Society’s Board of Directors from 2001 to 2004, and the recipient of numerous achievement awards. For more than 70 years, Bill made the woods his profession and his passion. He once said that dendrology—the study of trees—was his hobby. Bill was also a devoted husband. His wife of nearly 40 years, Ruth Helen Hagenstein (née Johnson) passed away in 1979. Bill married Jean Kraemer Edson in 1980. She passed away in 2000. Bill devoted both his professional and personal life to promoting forestry as the foundation of the Northwest economy because of the unique renewability of trees. He always emphasized that we must take good care of our forests and, in doing so, they will take good care of us. For Bill Hagenstein this responsibility meant cherishing our forests by using their bounty wisely and renewing them promptly by the practice of forestry. Everyone knows Smokey Bear, Woodsy Owl, and maybe even Ranger Rick Raccoon, but there are many other forest and forestry-related fictional characters that long ago fell by the wayside. Peeling Back the Bark‘s series on “Forgotten Characters from Forest History” continues with Part 12, in which we examine Benny Beaver. Although Benny Beaver is back in the news, don’t be confused. The one making news is Oregon State University’s mascot, and that’s because he’s been redesigned. Again. 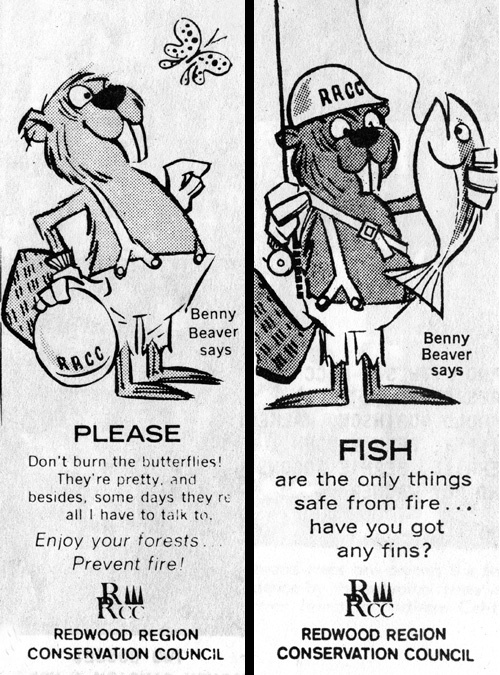 The Benny Beaver beloved by forest history buffs was the mascot for the Redwood Region Conservation Council (RRCC). The RRCC was a forest products industry group in the Redwood-Douglas fir region of California that sought to inform the public about the necessity of conserving the area’s natural resources, in particular commercial timber, and the importance of doing so for the benefit of all. 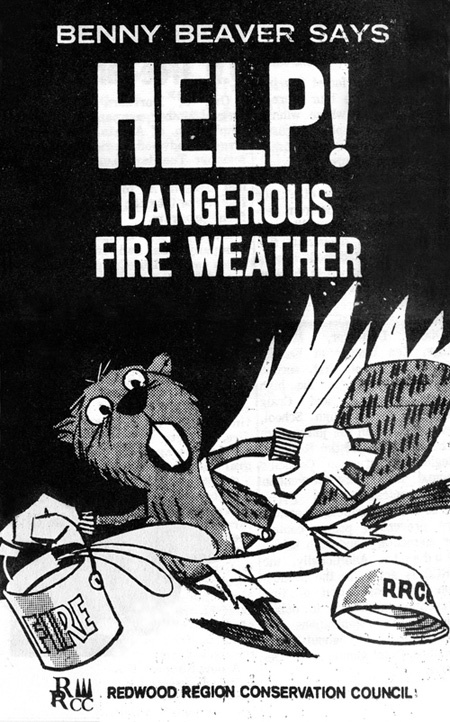 The RRCC was involved in certifying forests for the American Tree Farm System and already employed Woody and the Keep Green program to get the word out about fire prevention when Benny was introduced. What makes this character stand apart from all those is that his creators went to the trouble of formulating a backstory for him. Benny was introduced in the summer of 1965 (we don’t know when they stopped using him). In the introduction below, besides learning about Benny’s extended family and ancestors, they even implied that he was OSU’s Benny Beaver—hence the reference to being mauled by a wolverine (in 1965’s Rose Bowl, the University of Michigan handily defeated OSU.) And when Benny was introduced, Bernard Z. Agrons was RRCC’s president, so we think that’s where the name of Benny’s great uncle came from. Anyway, his creators did such an entertaining job on the backstory that I’m going to let the announcement of Benny’s “hiring” do the talking. Benjamin “Benny” Beaver—faller, bucker, dam-builder and member of the world-famed lumbering family—has joined the Redwood Region Conservation Council as its supervisor of forest activities. Benny applied to RRCC headquarters for work following a six-month period of convalescence. Last January 1 while inspecting the culinary qualities of the wood structures which support Pasadena’s Rose Bowl, he was seriously mauled by a curmudgeonly wolverine. Seems the wolverine had left his home in Michigan for a trip to Disneyland and had stopped off in Pasadena for some mild exercise. A beaver with a football was all he could find to tussle with. Healed, Benny headed back to his familiar forest where, he says, the most dangerous creatures are 21-year-old loggers on Saturday night and a funny old bear who wears a silly hat. Benny’s first assignment will be to work with that bear—Smokey they call him—in an effort to keep the Redwood Region green. But being a charter member of the “hard-hat-on-head, we’re-not-dead” club, Benny indicated he would try to talk Smokey out of wearing his felt campaign hat. Well known as an industrious woods worker, Benny has numerous qualifications for his job in forest conservation. His great-great-great granddaddy pioneered the technique of selective logging, and early lumberjacks copied Benny’s great uncle Bernard Z. Beaver’s method of getting logs from the forest to the mill by river floating. As a matter of fact, Benny’s cousins still excavate canals—some several hundred feet long—to float wood for life’s necessities into their communities. Their dams are engineered perfectly to keep the water in the canals at a proper depth…. That last statement reveals the stumbling block to success that so many forest history characters trip over: they are given too many things to simultaneously to represent and it confuses the target audience. Is Benny about fire prevention? Stopping litter bugs? Wise and multiple use? Aren’t the first two really just part of the third? This problem of a muddled message is why the Forest Service later created Woodsy Owl—people were trying to use Smokey Bear to talk about litter and other issues and it diluted the power of Smokey’s message. Further complicating Benny’s path to stardom was the introduction of Cal Green and Sniff and Snuff in California the same year Benny was introduced. How’s a beaver in cut-off overalls supposed to compete against charismatic Cal and the sartorial splendor of Sniff and Snuff? As Benny might say, dam if I know. Fighting forest fires in northern California kept Benny as busy as a, well, you know. The RRCC made ads like these available to newspapers. Redwood Region Conservation Council letterhead featuring Benny Beaver. RRCC vice president Norman Traverso with student poster contest winners, 1966. RRCC promotional bookmark featuring the “Woody” character. Recently processed with the help of graduate student intern Shaun Trujillo, the American Tree Farm System (ATFS) Collection is now open to researchers. The tree farm movement began in June of 1941 with the dedication of the Clemons Tree Farm in Washington. Since then, the American Tree Farm System’s membership and focus have moved from one dominated by industrial forests to that of family-owned forests. Its history reflects the broader history of private forest ownership as well as the history of public-private cooperative forestry. The records of the American Tree Farm System document the important history of tree farming in the U.S. The collection includes organizational records, press clippings, correspondence, inspection and certification records, publications, records of awards and conventions, and numerous photographs and slides of ATFS events and activities, as well as films of educational programming and public service announcements by famous tree farmers such as Andy Griffith. A complete inventory of the ATFS Collection is now available online. Researchers interested in the ATFS will also want to explore related collections at FHS such as the records of the American Forest Institute and the National Forest Products Association. For more background information and access to additional historic documents on tree farming in the U.S., visit our new ATFS history page: www.foresthistory.org/ATFS. Below you will find a few highlights from the American Tree Farm System Collection. Smokey Bear making an appearance at a tree farmer certification ceremony. 1942 letter discussing the emerging tree farm standards. Happy Valentine’s Day from the Forest History Society! While next June marks the official 70th anniversary of the first certified tree farm, the concept of renewable forestry can be traced back to the turn of the last century. The rise of the tree farm movement in America marked a shift in perspective towards privately owned forest land as a sustainable resource worthy of long-term conservation and management. Private landowners became important figures, working on behalf of the public’s interest as the stewards of this valuable resource. Promotional button commemorating 40 years of the Tree Farm System. The Forest History Society Library and Archives recently received 24 cartons of archival documents from the American Tree Farm System (ATFS). Currently being processed, the collection includes historical material such as essays from the 1940s and 1950s attempting to define the burgeoning movement, inspection and certification records of some of the first tree farms, and early press clippings. The majority of the collection’s documents cover the organization’s activities from 1980 to 2005, and include publications such as Tree Farmer Magazine and Green America, records of various awards for outstanding forestry such as the Tree Farmer of the Year and Inspector of the Year, minutes and related materials from annual conventions and committees, records from educational initiatives such as Project Learning Tree, and materials from dedications such as the certification of President Jimmy Carter’s tree farm. The collection also includes numerous photos and slides of ATFS events and activities, as well as films of educational programming, and public service announcements by famous tree farmers such as actress Andie MacDowell, musician Chuck Leavell, President Carter, and the incomparable Andy Griffith. The Clemons Tree Farm, a 120,000-acre plot in Washington State publicly dedicated by the Weyerhaeuser Timber Company on June 12, 1941, is recognized as the first official tree farm. 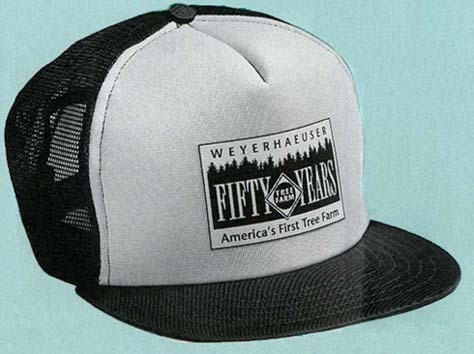 The tree farm movement originated as an initiative of industrial firms such as Weyerhaeuser managing large tracts of forestland to demonstrate self-regulation and sustainability. Over the years the ATFS has grown to include smaller private landowners, with the system currently estimated at 24 million acres of certified forestland managed by over 90,000 tree farmers. For more information about the history of the American Tree Farm System you can view an article by Richard Lewis entitled “Tree Farming: A Voluntary Conservation Program,” from the July 1981 issue of the Journal of Forest History.